JCHS Students Learning Potentially Life Saving Techniques! Memorie Hall, Courtney Johnson, and Heaven Pennington practice securing and stabilizing the head and neck of a patient, Julia Prado, who could have a broken neck or severe head injury. 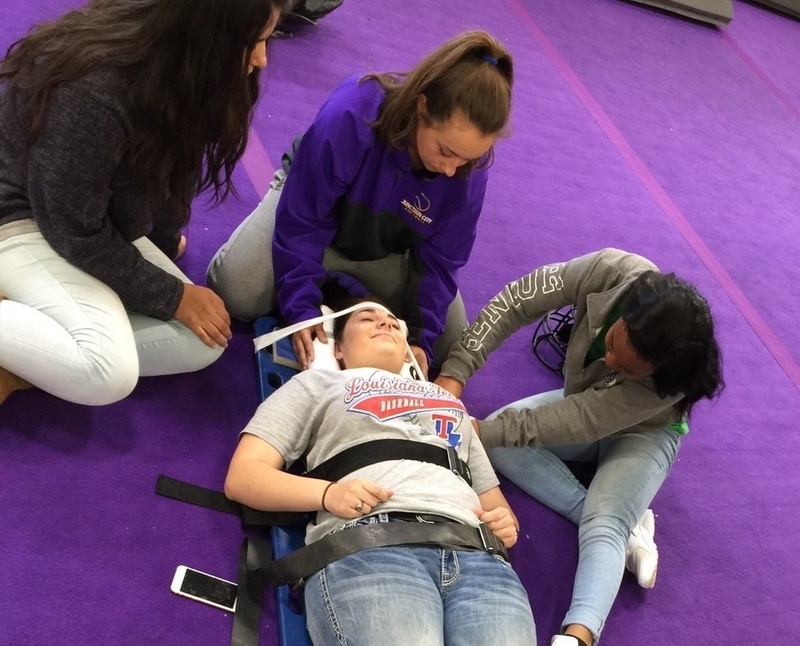 The students of JCHS's newly founded Sports Medicine Program are learning what goes into potentially saving a life not only on the field or court, but wherever the need may arise. The newly established Sports Medicine at Junction City High School as part of The Arkansas Career and Technical Education Department aims to help students interested in possibly entering the medical field not only for the field of Sports Medicine (Orthopedic Doctor, Physical Therapy, Occupational Therapy, Exercise Physiology, and Athletic Training) but also those interested in other fields such as Emergency Medical Technicians and Paramedics, and Family Practice Physicians. The program contests of Anatomy and Physiology, Foundations of Sports Medicine, and Injury and Assessment. These classes help to teach High School students the various parts of the body, how they function and may become injured. These classes give students a preliminary exposure to Evidence Based Medical Practices and understanding of basic human anatomy to aid the students pursuing a medical certification or degree after high school.